The Place After trying Lucky House Cantonese Private Kitchen earlier this year, I knew that would not be my last private dining experience. After some coordination with other foodie friends, we finally made our way to Lynnette’s Kitchen. For people who are unfamiliar with this private dining name, Lynnette’s Kitchen is run by Lynnette Seah, one of the Cultural Medallion winner and acclaimed violinist in Singapore. Housed in Lynnette’s HDB in Tiong Bahru, the experience is only available to friends and referrals as stated on the website. The space at Lynnette’s home is pretty spacious and air-conditioned. The Food The highlights is Peranakan dishes, which are also Lynnette’s forte. Priced at S$120 nett per person, it is one of the most pricey private dining experience so far. For the price, you get a seven course meal, inclusive of one dessert. The remaining six courses is up to your own preferences, which has to include one vegetable option. I would say the dishes are pretty wide in terms of variety, and my dining group has a hard time deciding on the final menu we were keen to have. We started with the Bakwan Kepiting Soup, which is a mix of pork meatballs with crabmeat, prawn, fish and organic fresh bamboo shoots in homemade chicken stock. This soup has a very clear texture, with a very light flavour to kickstart the rest of the meal. The pork meatballs are decent, not the best I had before. The second dish I tired was the Crab Bee Hoon. This turned out to be a crowd’s favourite and it is my favourite dish for the night. The fresh Sri Lankan crab is served separately from the Bee Hoon. In fact, I enjoyed the Bee Hoon more than the crab simply because the broth is way too delicious! The Bee Hoon is soaked in a rich broth after being prepared with the crab, hence it is the most comforting way for me to enjoy the dish. The rest of the dishes were all served together in one serving for sharing – we had the Assam Pedas Snapper Fillet with Honey Pineapple, Beef Short Ribs Rendang, Buah Keluak Prime Pork Ribs Stew and Chap Chye. I enjoyed the fish, with its distinct fresh flavours and a nice balance with the refreshing honey pineapple. The beef short ribs and buah keluak prime pork ribs stew are not so memorable for me. I was looking forward to a more intense buah keluak flavour but I didn’t quite taste that in the dish. That said, both are decent renditions for home style dining. The chap chye is a good balance to the heavy meat dishes, prepared along with black fungus, shiitake mushroom and lily stems. This dish is quite enjoyable. We were also served complimentary sides like Sambal Belacan and Buah Keluak Fried Organic Mixed Grain Rice. For the rice, I also feel that the buah keluak flavour could be stepped up. For desserts, the unanimous decision is to have the Sugee Cake. No regrets for me at least. Topped with Gula Melaka Cream Cheese, the sweetness of the cake is just right for me and I must profess that I’m usually not a big fan of sugee cake. The version also has a very moist texture, which makes the flavour very enjoyable. The Gula Melaka element is also very well-balanced and played on the cake. Rants The relatively steep price is the main gripe here, in comparison to other private dining experiences. Will I Return Again? 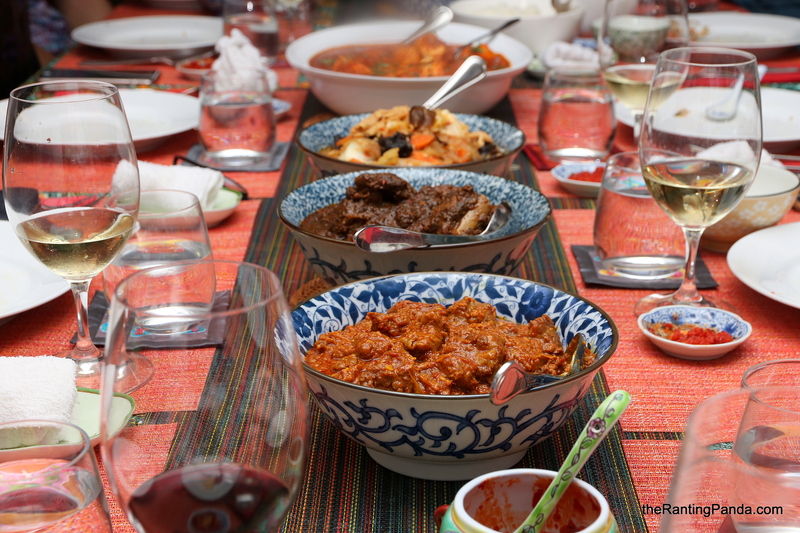 If you are a fan of Peranakan dishes, Lynnette’s Kitchen should be to your liking for a private dining experience. There are some dishes which I fancy more, just that I am not sure if I am willing to pay the same price tag again.